Guide to maintain roots, flip-free. I highly recommend adding these steps to your weekly dread maintenance routine, once you’ve washed your locks and damp palm rolled with Tightening Gel, if you really want to speed up the root-tightening process. We realize there is a lot of info out there and a million different techniques for helping roots dread faster: this is just our best advice based on years of creating and maintaining dreadlocks professionally! I have also made a video with the maintenance routine – Look bottom of the page! Root flipping, or interlocking, often gets presented in the same way as a crash diet or a get-rich-quick scheme – by promising fast results with little or no work on your part. When’s the last time one of those worked for you? 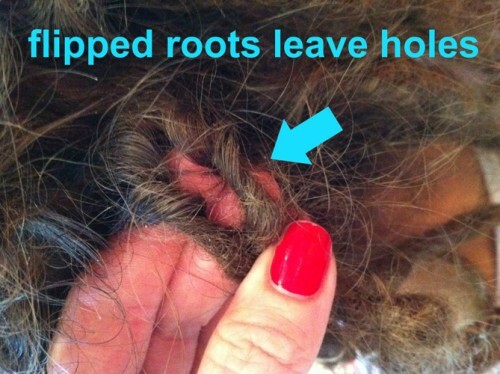 Luckily, the alternative to maintaining your dreads at home is way easier, and safer, than root flipping. It doesn’t yield such immediate results, but it works much better long-term, while keeping your locks strong and healthy. Start out by isolating the dread you want to work on. Use clips if you’ve got a ton of loose hair – it’ll make your life easier. 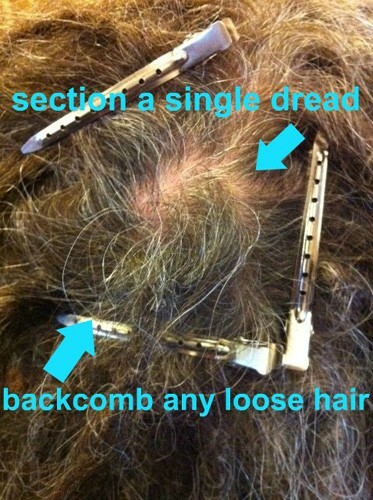 Once you’ve identified your section’s boundaries, grab the loose hair and the dreadlock. 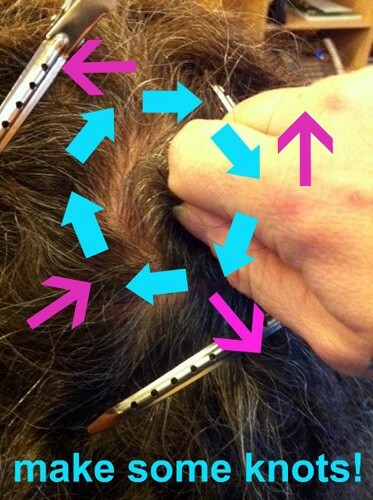 (If you have long loose hairs, it’s a good idea to backcomb them up before you move on to the next step. To ease the process use some lock powder). Get a good grip on the loose new growth and your dreadlock, making sure you don’t have any hair crossing over from another dread. Start rubbing it into your scalp. Some advice says to rub in a clockwise or counter-clockwise motion, but that’s kinda bunk – rub it every which direction! Go crazy! (Try not to hurt yourself, keeners.) Remember, what we’re trying to create here is knots. 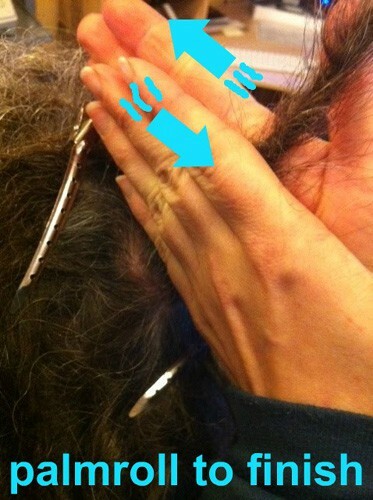 When you’ve got a good knot starting to form at your root, go ahead and give your dread a solid palm roll to the tip. If the dread is thoroughly dry inside and out, I like adding a light coating of Knotty Boy Dread Wax or Dollylocks pomade to my palms at this point to keep the lock looking tight and groomed, but that’s up to you. 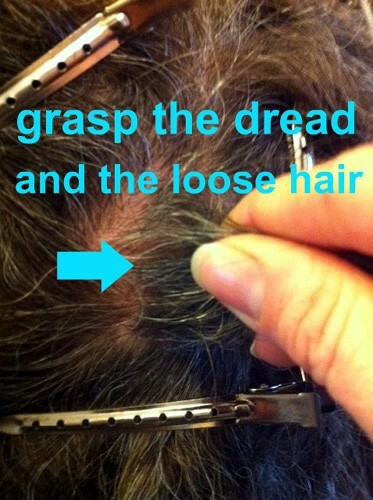 If you want your dread roots even tighter use a crochet hook to finish. You can also visit Palm Roling, Interlocking, Back Combing, Clockwise Rubbing for more info about maintaining dreadlocks! Here is a video guide! In this video Alin from Dollylocks show her professional way of maintaining dreadlocks.